DNA topoisomerases carry out topological transformations of DNA by introducing transient DNA breaks. The covalent intermediate of topoisomerase reactions include the topoisomerase protein covalently bound to DNA by a phosphotyrosine intermediate. Anti-cancer drugs that target topoisomerases typically trap the covalent intermediate, and generate cytotoxic enzyme dependent DNA damage. More recently, structural alterations in DNA such as DNA damage have also been shown to trap covalent intermediates of topoisomerase reactions. Understanding the action of drugs that target topoisomerases as well as determining the importance of trapped topoisomerases on genome stability requires assays that can accurately and sensitively measure levels of topoisomerase/DNA complexes. 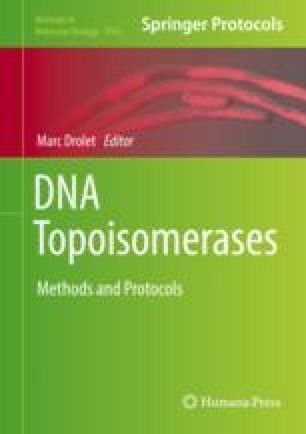 This chapter describes two approaches that have been developed to quantitate topoisomerase DNA complexes. These assays termed ICE (in vivo complex of enzymes) and RADAR (rapid approach to DNA adduct recovery) rely on isolation of genomic DNA under conditions that preserve proteins covalently bound to DNA. Covalently bound proteins are then quantitated using antibodies directed against specific topoisomerases. We describe assays in both mammalian cells and the yeast Saccharomyces cerevisiae that can measure topoisomerase/DNA covalent complexes, and give examples that can be used to enhance the quantitative reliability of these assays.